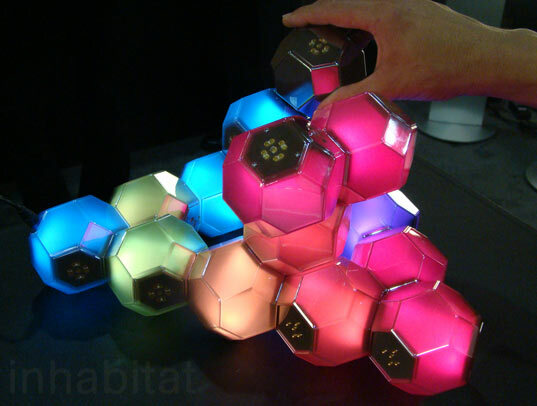 Glowing Hexagonal Crystal LED Light is a Lamp, Puzzle, Toy all in one! We use lamps for illuminating our homes and toys to stimulate our brains, but wouldn’t it be great to find inspired, engaging home decor products that can serve multiple functions (lamp, toy, decor), all in one? 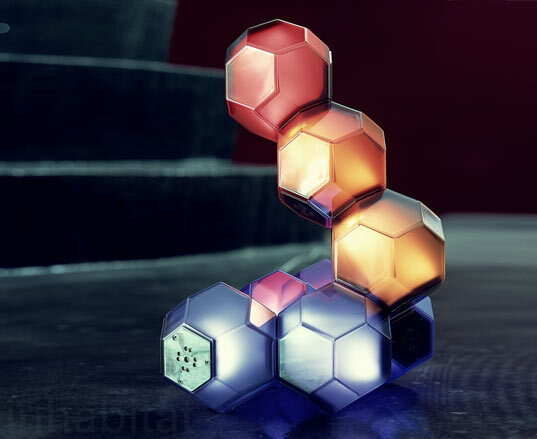 We just discovered this awesome new Crystal snap-together LED light from QisDesign at ICFF, and we’re head-over-heels in love with its playful and engaging design. Each LED Crystal Light is an individual glowing icosahedron with magnets in its skin that allows it to snap to any of the other crystals, allowing users to create a wide variety of forms that can be configured and reconfigured over and over. And even when you aren’t playing with the Crystal Light (which is hard to resist), these luminescent pieces do double duty as an eye-catching table lamp and conversation starter. The concept for Crystal Light was inspired by the natural growing crystals that refract and diffuse light so spectacularly. This fascinating table lamp radiates a fluid rainbow of light that can be changed using different settings allowing a user to create a lighting ambiance to match their mood and/or environment. The form of each modular component is represented in a crystalline shape and connects by magnets with adjacent units. The modular “crystal” units’ retail value is $800 per set of 8 units. EIGHT HUNDRED DOLLARS??? It's a cool idea - but really? What in the world justifies an asking price of $800? I'll wait for a tremendous price drop---like, down to $200, or wait for a cheap knock off. Remember, we ARE in a recession here folks! We use lamps for illuminating our homes and toys to stimulate our brains, but wouldn't it be great to find inspired, engaging home decor products that can serve multiple functions (lamp, toy, decor), all in one? We just discovered this awesome new Crystal snap-together LED light from QisDesign at ICFF, and we're head-over-heels in love with its playful and engaging design. Each LED Crystal Light is an individual glowing icosahedron with magnets in its skin that allows it to snap to any of the other crystals, allowing users to create a wide variety of forms that can be configured and reconfigured over and over. And even when you aren't playing with the Crystal Light (which is hard to resist), these luminescent pieces do double duty as an eye-catching table lamp and conversation starter.